February 25, 2018 – 10:45 a.m.
Focus Statement: God’s covenants and promises are not just for our ancestors, or for us, but also for our descendants. Although God is able to fulfill what has been promised, our human ways sometimes get in the way. What might be coming between Me (God) and You (the people), or between you and your descendants? Please check the Missionary Board for a new newsletter from Rachel Klassen. Sat. March 3, 7:45 a.m. Men’s Prayer Breakfast at Uncle Jake’s Restaurant. We hope to see you there! 8:30 a.m. SMC Women’s breakfast at Smitty’s. Open to women of all ages. Feb. 27, 7:00 p.m. Providence Public Lectures at Steinbach Arts Centre. “The Beginning in Light of the End: Re-Thinking Evolution Theologically” with Patrick Franklin. God, we call you ruler of all, but sometimes we make excuses. We try to avoid applying your rules to our actions and interests. At other times, we hold so tightly to rules that we break relationships. It is easier to imagine that you are like us than it is for us to be like you. We judge ourselves by success; you judge us by how we treat others. Help us to face our truth. Forgive us when we fail. Give us the courage to keep trying to live as you love. Join panelists representing three Abrahamic traditions who will share personal reflections about what Jerusalem means to them and the implications of the U.S. announcement. Please note that all are welcome (not just delegates) at the worship service which launches our MCM Delegate Gathering, Friday March 2, 7:00 PM, at First Mennonite Church. We think it is critical to launch our business and deliberations in worship, and to celebrate and be challenged as a community of congregations. Also note a change to the bulletin announcement about our guest speaker for this event. Invitation to the MCM Delegate Gathering Worship. All are welcome to worship and communion at First Mennonite Church, March 2, 2018. 7:00pm. Brian Bauman, Mission Minister for Mennonite Church Eastern Canada is our guest speaker. Delegate meetings take place on March 3. Sie sind herzlich eingeladen am Sonntagmorgen um 7.30 Uhr (CFAM / CHSM / CJRB) Frohe Botschaft einzuschalten, eine Sendung die von Mennonite Church Manitoba produziert wird. Im März hören Sie Predigten, die von Prediger John H. Neufeld aus der Ersten Mennoniten Gemeinde in Winnipeg vorbereitet wurden. Please join us for Frohe Botschaft, a German language worship service produced by Mennonite Church Manitoba and broadcast on Sunday mornings at 7:30 on CFAM / CHSM / CJRB. In March Frohe Botschaft will be broadcasting a series of messages prepared by John H. Neufeld from First Mennonite Church, but in another’s voice. 1. CMU is honoured to host Senator Murray Sinclair as he shares stories and insights of Canadian communities, churches, and educational institutions responding to the TRC 94 Calls to Action. Senator Sinclair will speak on ‘The TRC, Calls to Action, and the Mountain before Us: Stories of Hope and Challenge’. Monday, March 5, 7:00 PM in Marpeck Commons. An in-person and live-streamed event. 2. CMU presents “Journeying Together: Accompanying the Aging”. Join John H. Neufeld, Heather Campbell-Enns, Kathleen Rempel Boschman, Charlene Epp, and others as we explore what it means for congregational care teams, family members, and Christian professionals to journey together with the aging. Saturday, March 17th, 2018. For more information, and to register, please go to cmu.ca/pastorsworkshops. 3. Xplore: Keep Thinking: enrol in CMU’s 55-Plus Enrichment Program, offered Wednesday mornings at CMU from March 7 – April 11. Courses include “The Conflict Over ‘Holy Smoke’: Contextualizing the Gospel for Indigenous Peoples with Wendy Peterson (Instructor, North American Institute for Indigenous Theological Studies). For information and to enrol go to cmu.ca/xplore. 5. 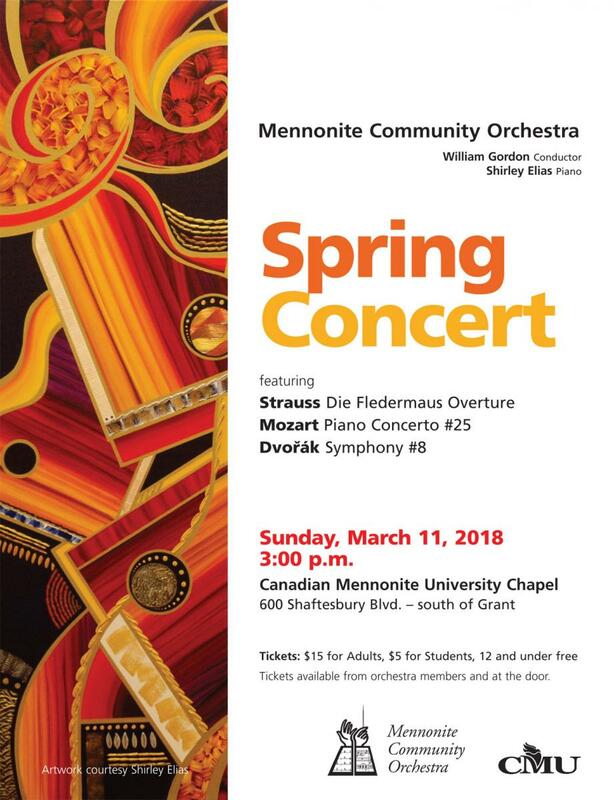 The Mennonite Community Orchestra, CMU’s Orchestra in Residence, presents its Spring Concert March 11 at 3:00 P.M. in the CMU Chapel. Featured works include Mozart's Piano Concerto #25, with soloist CMU Piano Instructor Shirley Elias, as well as works by Dvorak and Strauss. Tickets are $15 for adults, $5 for students and are available at the door. Children 12 and under free. See cmu.ca/events for details. 6. Prospective students and parents are invited to Campus Visit Day at CMU on March 9. Activities include campus and residence tours, attending university classes, a meeting for parents with enrolment staff, financial aid presentation, and meeting faculty. For more information see cmu.ca/campusvisit. 7. CMU Music Therapy students present a Coffee House, featuring student performances, on March 2, 7:00PM in Marpeck Commons, 2299 Grant Avenue. Admission free. 8. CMU hosts the Shi'a Muslim – Mennonite Christian Dialogue 7. The opening event at 7:00 PM on March 7 in Marpeck Commons will introduce presenters, welcome guests, and introduce the theme “Religion and Youth”. All are welcome. More information available at cmu.ca/community.